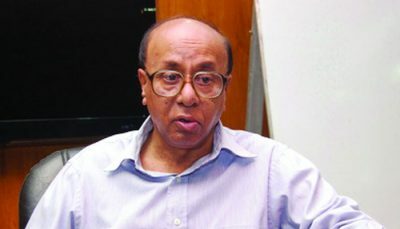 Monirul Alam : Finding high lending rates of private banks futile in raising credit to private sector, a former finance advisor to caretaker government observed that the central bank should look into interest rates on different credit products. The Bangladesh Bank’s (BB) January 2019 data shows most of the private banks charge double digit interest upto 16-17 percent for different credit products including term loan for industries, working capital for industries, housing loan, consumer credit and trade and commerce financing. “BB needs to look into lending rates. Because, growth of credit to private sector stands at bottom level, which is needs to be raised,” said Dr AB Mirza Azizul Islam, former finance advisor to caretaker government, yesterday. “Firstly, banks need to make profit to continue their operation. There is no chance to make profit without lending money. On the other hand, the country needs higher investment for employment generation and raising production,” he argued. He said the movement of interest rate depends on supply and demand of loanable fund in the market but sometimes a central bank needs to interfere for economic stability and growth. Meanwhile, the BB data shows, bank managements found non-compliant with regard to reducing lending rates to single digit despite the call of the central bank and consequent package of incentives. Considering high interest rate detrimental in attracting investment and acknowledging the importance of higher investment to bolster the economic growth, the central bank had urged private bank owners to bring down the interest to single digit to boost investment and economic activities in the country. Following the call, the central bank had reduced the CRR (Cash Reserve Requirement) to 5.5 percent for commercial banks on bi-weekly average basis from 6.5 percent to ease-up the liquidity condition in the money market. The reduction in the CRR is likely to give some cash-starved private banks required funds for meeting their customers’ requirements. Along with this fresh injection of money through the reduction in the CRR, the government has also decided to allow state agencies to deposit 50 percent of their funds with private banks, up from the existing ceiling of 25 percent, to tackle any liquidity stress in the banking sector. But, in last couple of years, banks could not show any impressive performance in raising credit to private sector. All banks’ credit to private sector grew only 5.65 percent during July-December periods against the target of 16.80 percent.